Songkran is one of the most important celebrations in Thailand – it is a celebration of the New Year and takes place annually in April. Throughout the country and islands, a wide range of celebrations are held – during this period Thailand is a truly special place to visit as the citizens relish the coming of spring and the festivities that ensue. The history of Songkran can be traced backed to ancient times and the tradition of providing gifts to local Buddhist monks. In ages past, the local population would regularly visit monasteries and shower the monks with gifts of food to help them survive and allow them to concentrate on their religious activities. As part of this tradition, the locals would also give blessings and pour scented water over the monks as a form of holy cleansing. This blessed water would then be carried back by the locals to share with their friends and family to benefit from the blessing. From these traditions, we can see how the water fights of Songkran came about. Aside from the tradition of water and offerings, each year is also associated with a particular animal. The chosen animal of significance changes annually, for example, 2017 was the year of the Rooster, and Songkran in 2018 will mark the year of the Dog. Songkran involves a myriad of traditional events and processes that practically all Thai citizens take part in. There are of course regional variations, but the general premise remains the same. A main concept of Songkran is the process of merit-making – this involves visiting local monasteries to provide gifts and blessings and is usually carried out in the morning. Blessed water is also usually poured over a statue of Buddha as part of the ritualistic process. During this period, family members who have moved away will traditionally return home and spend the holidays together. Furthermore, citizens will dress in bright and colourful Thai garments. Although Songkran in Thailand is steeped in tradition, it is renowned worldwide for its epic water fights. Water is a central element in this festival and it is a tradition to pour or throw water as a form of blessing. Over the years, this tradition has evolved and immense water fights are now held that can last for hours and include hundreds if not thousands of people! 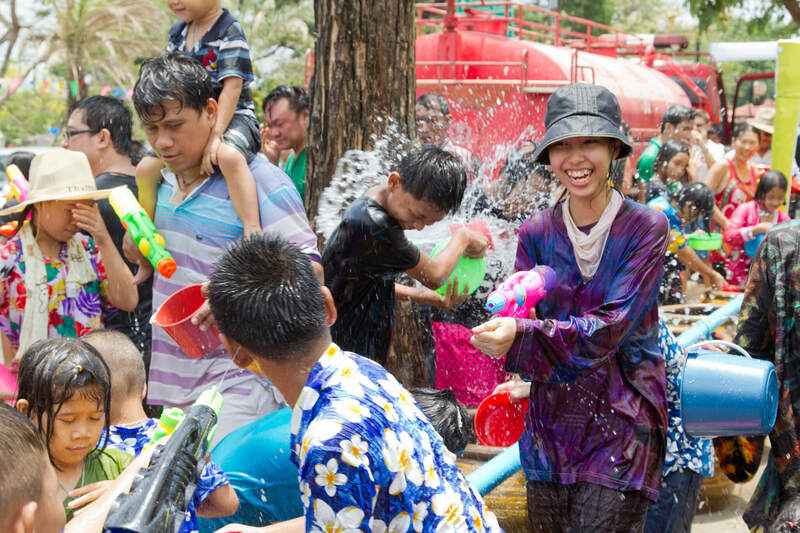 The largest water fight is held in Chiang Mai – it is a truly monumental sight to behold and be part of. Thai citizens and tourists alike take up arms in the form of water guns and engage in wet warfare – no one is safe and no one’s clothes will remain dry! If you haven’t got a water gun, fear not – if it can hold water and be thrown, then it can be used – it is not uncommon to see hose-pipes, baskets and kitchenware containers being used too. Although the water fights are generally for the younger generations, people of all ages will usually take part and if you visit Thailand during Songkran, be sure to pack some spare clothes you don’t mind getting wet! If you want to witness the joy and jubilance of Songkran 2018, we have provided some useful information on the dates (this varies by region), the major events, and the main areas to visit. In general, Pattaya is known to have the longest Songkran celebration whilst Koh Samui offers a more relaxed affair. If you want to experience Songkran with no holds barred then head to Chiang Mai – the water fights here are legendary and stretch for miles within the old city walls. Bangkok’s two notorious roads (Silom and Khao San) offer similar high octane parties but are generally packed with backpackers and tourists. No matter where you travel in Thailand during this period you are guaranteed to find some form of celebration. If you have recently moved to Thailand, or if you are travelling through the country during this festive period we can offer you some words of wisdom and advice. Firstly, Thailand becomes extremely busy during this period – families living abroad may return home and many tourists visit Thailand during this time specifically to experience Songkran. Expect the major cities such as Bangkok and Chiang Mai to become jam-packed, traffic to increase, and a general slowdown of services – the whole country is basically on holiday! Secondly, expect to get wet. We touched on this above, but it has to be reiterated. Thai citizens and tourists alike will drench you whether you want to get wet or not – you literally don’t have a choice. In the main tourist areas such as Khao San Road and the Old City in Chiang Mai the water fights can become extremely intense and if you don’t want a soaking, we would advise avoiding these areas. If you do venture into the crowds it is advisable to wear old clothes that you do not mind getting wet. Finally, if you really don’t like getting wet then the best policy during this period is to simply avoid crowded areas or stay indoors! Songkran really is a fascinating and delightful celebration and a great way to experience Thai culture – we hope you have found this guide useful, let us know if you have experienced Songkran and share with us your memories of this wonderful time!